I can never say enough about the Swiss Meringue Frosting. It’s my favorite frosting next to the whipped Cream frosting. The beauty about Swiss Meringue frosting is that it is so light and fluffy and can be confused with whipped frosting. Swiss meringue frosting is a short cut way of making the famous Italian Meringue frosting which involves intricate steps. I highly recommend this frosting; it’s worth all the effort and pipes so well. They are ideal for decorating layered cakes and regular cupcakes. I always like to try this frosting with different flavor. I made these cupcakes for a potluck at my work and I got raving comments like 'Killer Cupcakes, Dynamite Cupcakes' from my coworkers about these cupcakes. 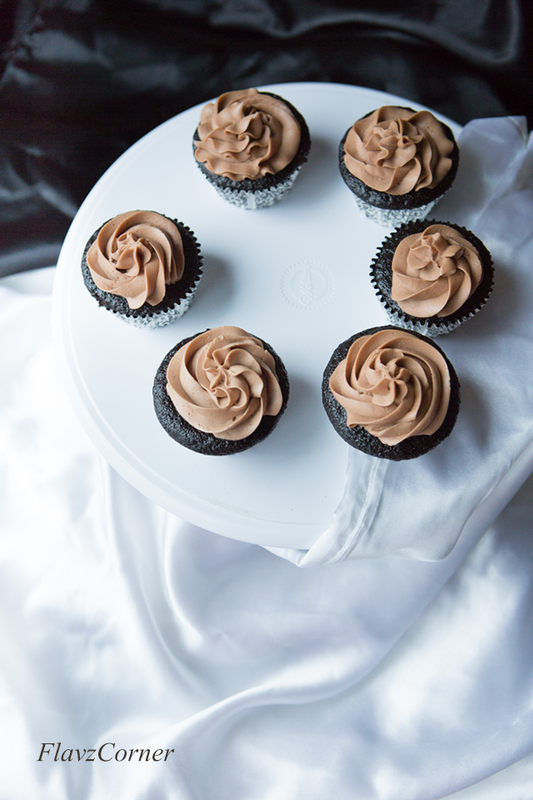 I believe it was the combination of the black magic chocolate cake and the Nutella Swiss meringue frosting that made them the exquisite chocolate cupcakes. 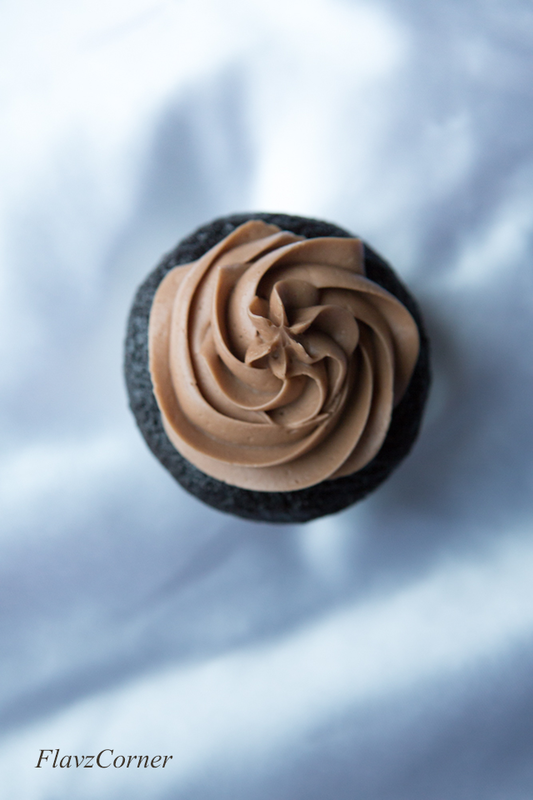 This experimental combination turned out to be the best chocolate cupcake I ever made. If you are planning to make any chocolate cake in the future, I insist to try this recipe for the best moist chocolaty cake you can have and top them with this fluffy silky smooth Nutella Meringue frosting. It's a luscious combination that you cannot resist. 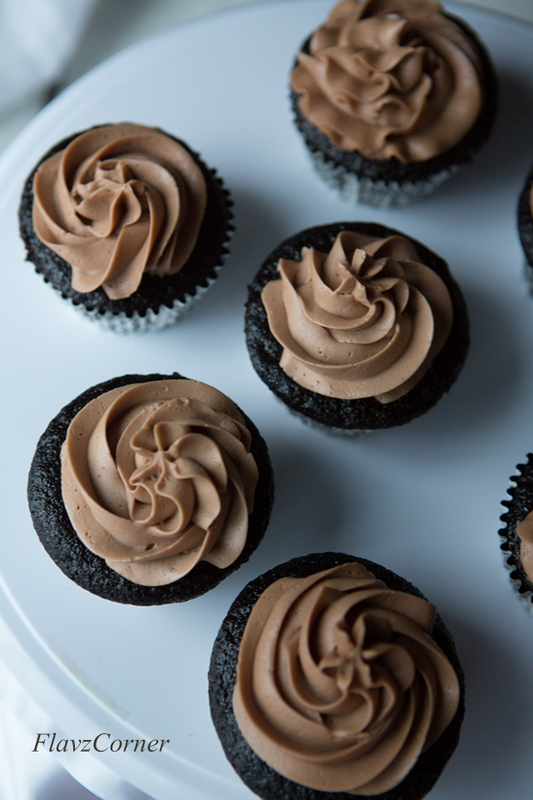 Use 1 batch + 1/2 batch of the black magic chocolate cake recipe to make 36 cupcakes. Make sure that you fill only 3/4 of the cupcake liner with the batter, so that the cake batter won't ooze out while baking. 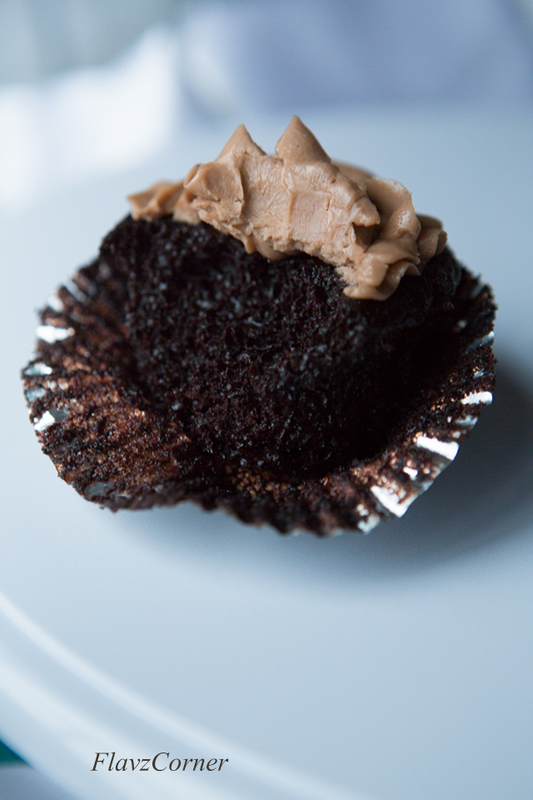 Bake the cupcake at 350 F for 25 minutes or till a tooth pick comes out clean when tested in the center of the cupcake. I made them in batches to avoid burning. Let the cupcake cool completely before decorating. Double boiler Method - Fill half of a sauce pan with water and let it simmer over a stove top. Place 5 egg whites and 2/3 cup of sugar into the heat proof bowl that can fit on top of the sauce pan without touching the water. Using a wire whisk, stir the egg sugar mixture continuously till you don't feel any sugar crystals when rubbing the mixture between your fingers. At this point you can notice that the egg sugar mixture is clear with light pale color. If you have a candy thermometer, it should read 160°F which makes the egg whites safe to use. Turn off the flame. Now add the cold butter pieces one at a time and whip till the butter is mixed well with the egg white. This needs good 10 minutes of whipping. At this point you will notice that the frosting looks lumpy and soupy, you will also notice little wetness in the frosting. Don't panic, this is part of the process. Just keep beating. It will start to come along. Add the powdered sugar in batches to the butter mixture at this point and keep beating. The frosting will come along as a smooth fluffy frosting within 2 -3 minutes. Now add 6 tbsp. of Nutella and vanilla extract. Whip it on high for 1 - 2 minutes or till the frosting forms sharp peaks. Place the frosting into piping bags and decorate the cupcakes. I used Wilton 1M and 2D tips to decorate the cupcakes. If this recipe yields more frosting than what you need, just half the recipe. You can use 3 small egg whites and half the amount for rest of the ingredients to make half batch. Please note that my recipes follow the US Standard measurements. You can add more Nutella. Just keep in mind that the sweetness of the frosting will increase, or else you can adjust the amount of powdered sugar to keep the balance. Left over frosting can be stored in air tight container in the refrigerator. To reuse the refrigerated frosting, keep the frosting at room temperature for 15 - 20 minutes; whip the frosting again before decorating the cake. 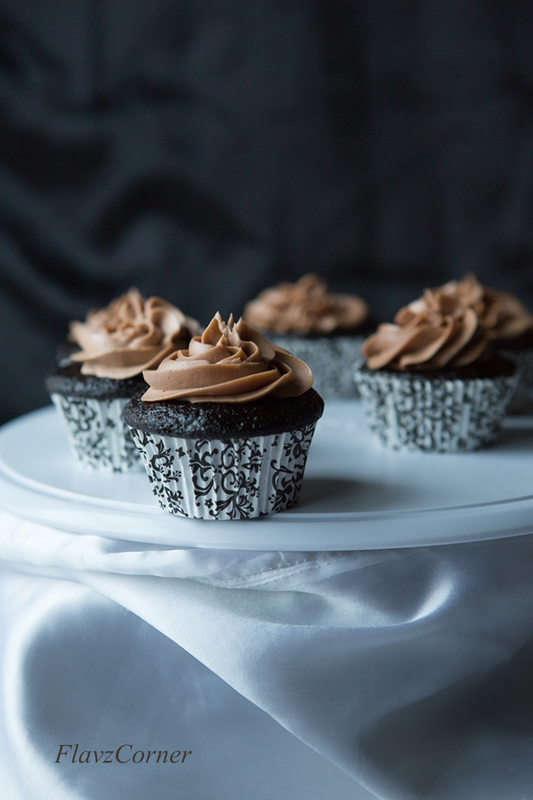 If the temperature is higher outside, the decorated cupcakes can be kept in the refrigerator which helps to hold the frosting intact. Love the frosting. It is holding up so well. I don't get whipping cream here, so can never try much of piping! This is just the recipe I need. I too love whipped cream frosting n swiss meringue frosting very much..this looks a heavenly treat to me...wish I could grab a few,Shibi...Beautiful and moist ones!! Wow! These cupcakes look amazing! I'm mouthwatering right now! Gorgeous Shibi! That first pic took my breath away and when I finally got to the words, chocolate and nutella, they made me swoon all over it again! Hello Shibi, how are you? I have always been intimidated by cooked frosting - and never tried my hand at it so thank you for sharing this step by step tutorial - I cannot wait to give this a try - it looks so mouthwatering! They look heavenly with that beautifully piped frosting! Yours pictures and icing work is crazy good. How I missed visiting blogs and craving for all of that. Glad to be back and thank you so much for visiting and still supporting after all these months. Hope you are doing well and looking forward to more desserts from you. Shibi, how did you like your new Savora colander? Looks so moist and delicious!!! These cupcakes are so beautiful!! And that frosting... I just want to dive head first into that bowl of frosting!!! Wow! 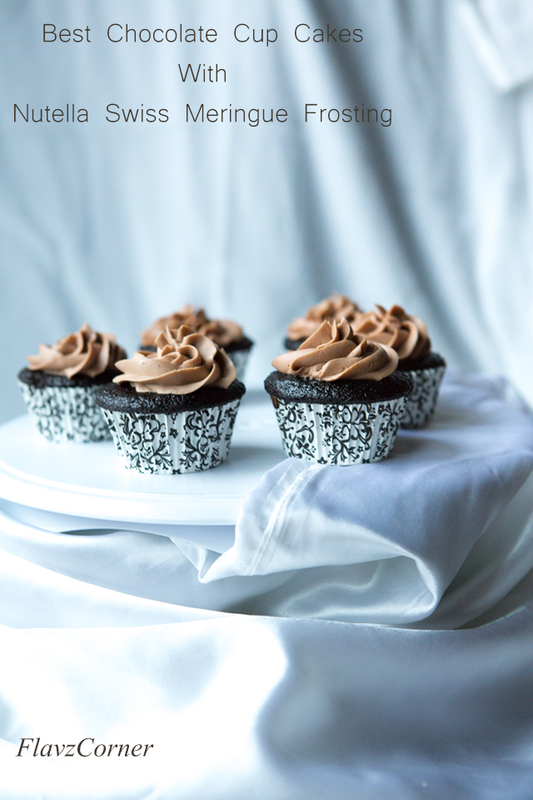 You've packed a lot of flavor into these wonderful looking cupcakes. Love the pictures! Thanks. Oh such pretty cupcakes ..love the first pic very well taken. I can see why u call it dynamite looks really yummm..